WASHINGTON, DC, December 17, 2012 (ENS) – In an unprecedented collaboration, offshore wind developers have agreed to voluntary measures that will protect critically endangered North Atlantic right whales, while expediting responsible offshore wind development in the Mid-Atlantic. 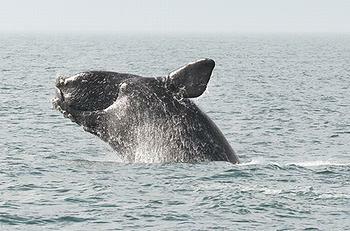 Experts estimate that just 350 to 400 individual North Atlantic right whales remain after centuries of whaling. The species is now protected by national and international law. Recent analysis of sightings suggests a slight growth in population size, but, North Atlantic right whales remain critically endangered. 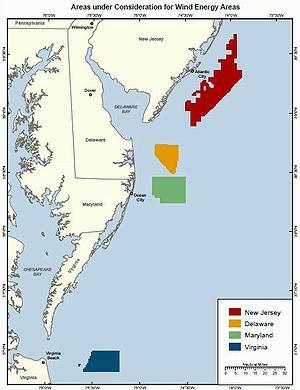 Building upon proposed federally mandated protections, the Conservation Law Foundation, the National Wildlife Federation, Environment America and the Natural Resources Defense Council worked with NRG Bluewater Wind and Deepwater Wind Energy Management, Inc., the owner of Cape Wind in Massachusetts, which has received all needed permits to build the nation’s first offshore wind farm in Nantucket Sound. The agreement grew out of a shared objective to develop clean, renewable offshore wind energy in the Mid-Atlantic region to reduce carbon emissions from burning fossil fuels that threaten the ocean, wildlife and the climate. The two sides have drafted a set of protective measures that the two wind developers will implement over the next four years in areas designated by the federal government as Mid-Atlantic Wind Energy Areas, stretching from New Jersey to Virginia. The agreed measures protect the whales by reducing or avoiding sounds from exploratory activities that developers use to determine where to build wind farms. The sounds might be generated by the construction of temporary towers to measure weather conditions and underwater surveys that assess the geology beneath the ocean floor. Underwater acoustic disturbances can disrupt whale communication, migration and feeding. “We share with these leading developers a common objective to get offshore wind up and running as quickly as possible as a key tool in the fight against climate change,” said Tricia Jedele, vice president and director of Conservation Law Foundation Rhode Island. “To be clear, removing obstacles to offshore wind doesn’t mean cutting corners. Indeed, these companies have worked pro-actively with scientists and members of the environmental community to develop these new right whale protections and build them into their business plans. It’s a win-win agreement that both enhances protection for critically endangered right whales and advances offshore wind’s progress in the Atlantic,” said Jedele. Justin Allegro, renewable energy and wildlife program manager at the National Wildlife Federation, said both clean energy and a thriving right whale population are important. Jeffrey Grybowski, CEO of Deepwater Wind, led the industry in developing the agreement. “Offshore wind energy is a critical component to our nation’s long-term energy security. We have an enormous energy resource right off of our coast and developing it will help preserve our environment and protect species like the North Atlantic right whale,” he said. North Atlantic right whales migrate from wintering and calving areas in coastal waters off the southeastern United States to summer feeding and nursery grounds in New England waters and north to Nova Scotia, Canada. One of their highest use areas is Massachusetts Bay and Cape Cod Bay, near the Cape Wind development. In September, two barges operated by a Dutch-based engineering and geoscience consulting firm began underwater environmental testing for every one of the 130 wind turbines planned for Cape Wind. The new agreement reduces the threat to right whales by limiting weather tower construction and other activities during the peak migration season, when whales travel through the mid-Atlantic region between southern calving and northern feeding grounds. During other times of the year, when the whales frequent the area less, the activities may take place with additional protective measures. Enhanced real-time human monitoring for whale activity in the site area and restriction of activities to daylight hours when whales can be spotted, will help the giant mammals to survive. The use of noise-reducing tools and technologies will help, and a lower speed limit for vessels in the area during migration times will help the whales avoid ship strikes. “I was pleased at the responsiveness of the wind farm developers to right whale issues,” said Dr. Scott Kraus of the New England Aquarium, one of the leading authorities on the North Atlantic right whale, science advisor to the parties, participant in the negotiations and a signatory to the letter. “Many of the wind farm areas occur in the migratory corridor for this endangered species, and this agreement should help minimize the effects of development on the continued recovery of right whales,” said Dr. Kraus. The agreement also has the support of such other environmental organizations as the International Fund for Animal Welfare, Oceana, the Sierra Club and the Southern Environmental Law Center. In Europe, offshore wind projects have been providing an increasingly large portion of power for over a decade. In the United States, not a single offshore wind project has yet been built, but the U.S. Atlantic coast has some of the world’s best offshore wind resources. Harnessing just a fraction of the Atlantic coast’s offshore wind resources could generate enough clean electricity to power to about 14 million U.S. homes, while creating over $200 billion in new economic activity along the coast.